Background and Aim: Recovery of patients with chronic low back pain (LBP) is depended on several physical and psychological factors. Therefore, the authors aimed to examine the efficacy of mindfulness based stress reduction (MBSR) as a mind-body intervention on quality of life and pain severity of female patients with nonspecific chronic LBP (NSCLBP). Effectiveness of mindfulness meditation on pain and quality of life of patients with chronic low back pain Eighty-eight patients diagnosed as NSCLBP by physician and randomly assigned to experimental (MBSR+ usual medical care) and the control group (usual medical care only). The subjects assessed in 3 times frames; before, after and 4 weeks after intervention by Mac Gil pain and standard brief quality of life scales. Data obtained from the final sample analyzed by ANCOVA using SPSS software. 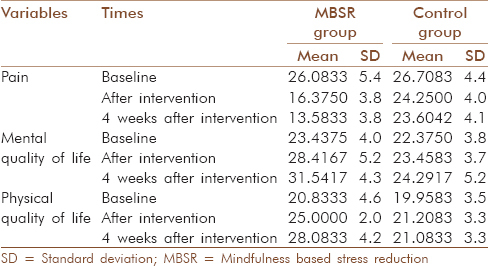 Results: The findings showed MBSR was effective in reduction of pain severity and the patients who practiced 8 sessions meditation reported significantly lower pain than patients who only received usual medical care. There was a significant effect of the between subject factor group (F [1, 45] = 16.45, P < 0.001) and (F [1, 45] = 21.51, P < 0.001) for physical quality of life and (F [1, 45] = 13.80, P < 0.001) and (F [1, 45] = 25.07, P < 0.001) mental quality of life respectively. Conclusion: MBSR as a mind-body therapy including body scan, sitting and walking meditation was effective intervention on reduction of pain severity and improvement of physical and mental quality of life of female patients with NSCLBP. Prior to the current accepted biopsychosocial model, the biomedical model dominated all illness conceptualizations for almost 300 years and still dominates in the popular imagination. First proposed by Engel (1977) the biopsychosocial model acknowledges biological processes but also highlights the importance of experiential and psychological factors in pain. The famous gate control theory of pain  also proposed that the brain plays a dynamic role in pain perception as opposed to being a passive recipient of pain signals. They suggested psychological factors can inhibit or enhance sensory flow of pain signals and thus influence the way brain ultimately responds to painful stimulation. If mind processes can change the way the brain processes pain then this holds tremendous potential for psychological intervention to produce reduced pain signals from the brain. Kabat-Zinn's et al. (1986) described the process of pain reduction in his paper on mindfulness and meditation. The process of pain reduction occurred by "an attitude of detached observation toward a sensation when it becomes prominent in the field of awareness and to observe with similar detachment the accompanying but independent cognitive processes which lead to evaluation and labeling of the sensation as painful, as hurt." Thus, by "uncoupling" the physical sensation, from the emotional and cognitive experience of pain, the patient is able to reduce the pain. The patients' descriptions of distraction from pain, identifying maladaptive coping strategies toward pain and heightened awareness of pain sensation leading to behavioral changes are examples of how pain is unassociated with emotion, cognition, and sensation [Figure 1]. Therefore recently these theories attracted several researchers who are working on pain. Mindfulness meditation has roots in Buddhist Vipassana philosophy and practice and has been independently adopted within clinical psychology in Western societies. ,,, Recently in Netherlands Veehof et al. conducted a systematic review of controlled and noncontrolled studies on effectiveness of acceptance-based interventions such as mindfulness-based stress reduction program, acceptance and commitment therapy for chronic pain. Primary outcomes measured were pain intensity and depression. Secondary outcomes measured were anxiety, physical well-being and quality of life. Twenty-two studies randomized controlled studies clinical controlled studies without randomization and noncontrolled studies were included totaling 1235 patients with chronic pain. An effect size on pain of (0.37) was found in the controlled studies. The effect on depression was (0.32). The authors concluded that ACT and mindfulness interventions had similar effects to other cognitive-behavioral therapy interventions and that these types of interventions may be a useful alternative or adjunct to current therapies. Chiesa and Serretti also conducted another systematic review on 10 mindfulness interventions. The main findings were that these interventions produced small nonspecific effects in terms of reducing chronic pain and symptoms of depression. When compared to active control groups (support and education) no additional significant effects were noted. In summary, there is a need for further studies into the specific effects of mindfulness studies on chronic pain. Regarding as the researcher knowledge efficacy of mindfulness has not been explored on quality of life of chronic pain patients in Iran. The authors aimed to examine the impact of mindfulness based stress reduction (MBSR) protocol designed for pain management on quality of life and pain of a homogeneous sample of females with nonspecific chronic LBP (NSCLBP) in comparison of the usual medical care group. 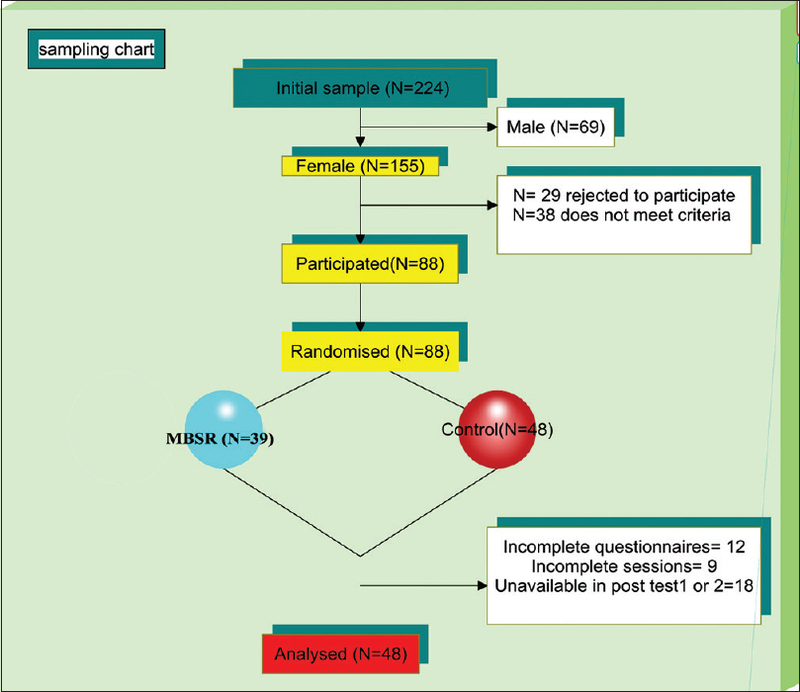 Out of initial female samples aged 30-45 (n = 155) who diagnosed as chronic NSLBP by physicians in physiotherapy centers of Ardebil-Iran at least 6 months before. Only 88 met inclusion criteria and gave consent to participate in the research program. Patients were randomly assigned in small groups to receive MBSR plus medical usual care (experimental group) and medical usual care (control group). Some patients dropped during and after the treatment. The final sample of the study comprised of 48 females. Consent and willingness to alternative and complementary therapies for pain management. Unavailability in next 3 months. The proposal of study approved by the scientific committee of "Panjab University," psychology department and all patients signed consent to participate in the present study. The study approved in India (in the university which researcher done her PhD), but conducted in Iran because researcher is from Iran originally and there was language and culture difference problem. Approval from Institutional Ethics Committee of physiotherapy center of Ardebil was obtained in Iran also to carry out the research. The study made use of the pre-post quasi time series experimental design to assess the efficacy of MBSR in 3 times frames (before-after-4 weeks after the program). 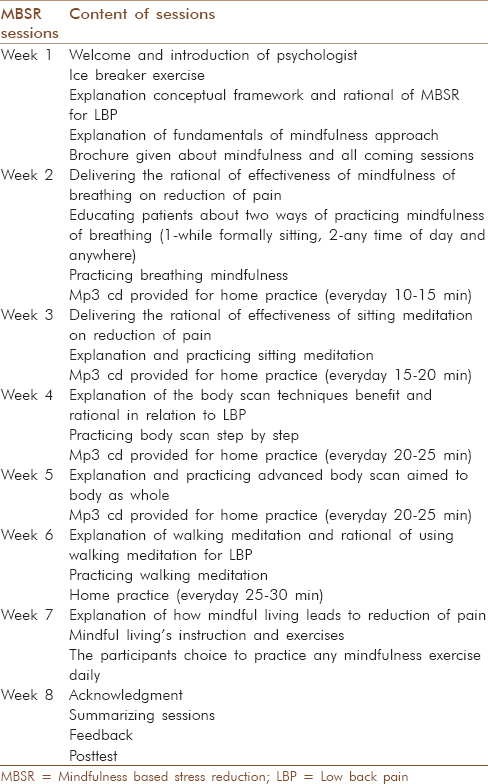 A MBSR program administered one session per week for explaining techniques, practice, and feedback and share their experience for 8 weeks beside 30-45 min' daily home practice [Table 1]. The intervention was conducted in three groups included 7-9 participants in each group. The process of framing the program was based on the quid lines provided by Kabat-Zinn, Morone (2008a, 2008b and 2007) ,,, and some adaptation done for the patients involved in the study. The control group was not offered any type of intervention in the research project. Consequently, they underwent the normal routines in healthcare including physiotherapy and medicine. The main component of this scale consists of 15 descriptive adjectives, 11 sensory including: Throbbing, Shooting, Stabbing, Sharp, Cramping, Gnawing, Hot-burning, Aching, Heavy, Tender, Splitting, and four affective including: Tiring-exhausting, Sickening, Fearful, Punishing-cruel, which are rated by the patients according to their severity on a four point scale (0 = none, 1 = mild, 2 = moderate, 3 = severe), yielding three scores. The sensory and affective scores are calculated by adding sensory and affective item values separately, and the total score is the sum of the two above-mentioned scores. In this study, we just used pain rating index with total scores. Adelmanesh et al.,  translated and validated Iran version of this questionnaire. The SPSS 20 (Armonk, NY: IBM Corp) was used to analysis of data. For descriptive analysis mean, standard deviation (SD) used. For performing ANCOVA, the pretest scores were used as covariates. The mean age was 40.3, SD = 8.2. 45% of females were working and the rest were a house wife. 38% had two children, 55% one child and the rest did have children. All were married and from middle-income families. 9.8% of patients reported very low physical quality of life, and the rest were low (54.8%) and moderate (36.4%). This was 12.4%, 40% and 47.6% very low, low and medium levels of mental quality of life in patients participated in our study (n = 48). 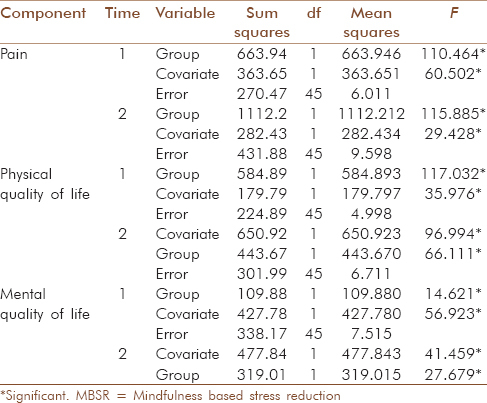 The mean and SD of patients in MBSR and control group showed a decrease in pain and increase in mental and physical quality of life [Table 2]. The results indicated that after adjusting for pretest scores, there was a significant effect of the between subject factor group (F [(1, 45)] =110.4, P < 0.001) and (F [(1, 45)] =115.8, P < 0.001). Adjusted post-test scores suggest that the intervention had an effect on increasing the pain scores of the NSCLBP patients who received the MBSR as compared to those who were in the control group and did not receive any mind-body therapy [Table 3]. The results shows that after adjusting for pretest scores, there was a significant effect of the between subject factor group (F [(1, 45)] =16.45, P < 0.001) and (F [(1, 45)] =21.51, P < 0.001). Adjusted post-test scores suggest that the intervention had an effect on increasing the physical quality of life scores of the NSCLBP patients who received the MBSR as compared to those who were in the control group and did not receive any mind-body therapy [Table 3]. The results also showed that after adjusting for pretest scores, there was a significant effect of the between subject factor group (F [(1, 45)] =13.80, P < 0.001) and (F [(1, 45)] =25.07, P < 0.001). Adjusted post-test scores suggest that the intervention had an effect on increasing the mental quality of life scores of the NSCLBP patients who received the MBSR as compared to those who were in the control group and did not receive any psychological therapy [Table 3]. The results showed that the experimental group who were subjected to the MBSR showed a significant improvement in their overall pain severity, physical and mental quality of life scores due to the training received as compared to the control group who received only usual medical care. The program reduced pain perception and enhanced both physical and mental quality of life and impacted on the experimental group clearly in comparison of the usual medical care. Baranoff et al., 2013,  Nyklνcek and Kuijpers, 2008,  and Morone (2) et al., 2008  reported the same results. Kabat-Zinn et al. believed the process of pain reduction occurred by "uncoupling" the physical sensation, from the emotional and cognitive experience of pain, the patient is able to reduce the pain. In the current study, the participants uncoupled the different components of the experience of pain. Breathing exercise distract their mind from pain to breathing and mindful living made them aware about maladaptive coping strategies. In the first session, information given about the fundamentals of mindfulness, describing the mindfulness supporting attitudes included being nonjudgmental toward thought, emotions or sensations as they arise, patience, nonstriving, compassion, acceptance and curiosity gave them a wisdom and believe that they are suffering from painful thoughts more than the pain itself. Furthermore, during body scan practice they learned to see their real body conditions, as it truly was, without trying to change the reality. Accepting their chronic illness condition helped them see the other possible abilities in their social and emotional roles. In fact the body scan practice helped them change the relationship with their body and pain. Through direct experience in body scan, one realizes the interconnection between the state of the mind and the body, and thereby increases patients' self-control over their life. Mindful living techniques also improved their quality of life by teaching them to pay more attention to their daily life necessities, which led to the experience of subtle positive emotions, like peace and joy, self-esteem and confidence. Furthermore, they appreciated positive things. Once they learned to see the persistent pain objectively and observe other sensations in their body, they applied the same principles through mindful living techniques in their everyday life. As a result, they learned how to manage their health and began to engage in their duties mindfully. A number of research studies such as Plews-Ogan et al.,  Grossman et al.,  and Sephton et al., (2007)  showed effectiveness of mindfulness meditation program on quality of life of patients with chronic pain conditions. All together the result of this study and previous studies highlighted the effectiveness of complementary and alternative treatment for patients with chronic LBP. Regarding the considerable role of quality of life in professional and personal life designing the effective psychotherapies especially for enhancement of quality of life of patients with chronic LBP strongly suggested by the authors. This study involved with several limitations such as ununiformed usual care received by patients. The provided physiotherapy sessions or methods and medicine prescribed by different physicians in slightly different manner. Although some patients commonly dose not completed physiotherapy sessions. The sample size was small and it was only limited to three centers. This is suggested for future researchers to conduct study with considering physiologic variables such as MRI, NMR and neurologic signals to test the efficacy of MBSR to decrease pain sufferer. In conclusion, more evidence-based larger scale researches with longer-term follow-up need to be done to increase the therapeutic weight and value of MBSR as a part of complementary alternative medicine being preventive and rehabilitation method among CLBP patients. We are thankful from patients who were corporate with us. Dr. Afzalifard and staff of physiotherapy centers of Ardebil. Waddell G. The Back Pain Revolution. London, England: Churchill Livingstone; 1998. Kovacs FM, Abraira V, Zamora J, Fernández C, Spanish Back Pain Research Network. The transition from acute to subacute and chronic low back pain: A study based on determinants of quality of life and prediction of chronic disability. Spine (Phila Pa 1976) 2005;30:1786-92. Melzack R, Wall PD. Pain mechanisms: A new theory. Science 1965;150:971-9. Beverly ET. Cognitive Therapy for Chronic Pain: A Step-by-Step Guide. USA: The Guilford Press; 2010. Kabat-Zinn J, Lipworth L, Burney R, Sellers W. Four-Year Follow-up of a meditation-based program for the self-regulation of chronic pain: Treatment outcomes and compliance. Clin J Pain 1986;2:159-73. Wetherell JL, Afari N, Rutledge T, Sorrell JT, Stoddard JA, Petkus AJ, et al. A randomized, controlled trial of acceptance and commitment therapy and cognitive-behavioral therapy for chronic pain. Pain 2011;152:2098-107. Baer RA. Mindfulness training as a clinical intervention: A conceptual and empirical review. Clin Psychol Sci Pract 2003;10:125-43. Glombiewski JA, Hartwich-Tersek J, Rief W. Two psychological interventions are effective in severely disabled, chronic back pain patients: A randomised controlled trial. Int J Behav Med 2010;17:97-107. Veehof MM, Oskam MJ, Schreurs KM, Bohlmeijer ET. Acceptance-based interventions for the treatment of chronic pain: A systematic review and meta-analysis. Pain 2011;152:533-42. Chiesa A, Serretti A. Mindfulness-based interventions for chronic pain: A systematic review of the evidence. J Altern Complement Med 2011;17:83-93. Kabat-Zinn J. Full Catastrophe Living: Using the Wisdom of Your Body and Mind to Face Stress, Pain and Illness. New York: Dell Publishing; 1990. Morone NE, Greco CM. Mind-body interventions for chronic pain in older adults: A structured review. Pain Med 2007;8:359-75. Adelmanesh F, Arvantaj A, Rashki H, Ketabchi S, Montazeri A, Raissi G. Results from the translation and adaptation of the Iranian Short-Form McGill Pain Questionnaire (I-SF-MPQ): Preliminary evidence of its reliability, construct validity and sensitivity in an Iranian pain population. Sports Med Arthrosc Rehabil Ther Technol 2011;3:27. Ware JE Jr, Kosinski M, Turner-Bowker DM, Gandek B. How to Score Version 2 of the SF-12® Health Survey (With a Supplement Documenting Version 1). Lincoln, RI: Quality Metric Incorporated; 2002. Montazeri A, Vahdaninia M, Mousavi SJ, Omidvari S. The Iranian version of 12-item short form health survey (SF-12): A population-based validation study from Tehran, Iran. Health Qual Life Outcomes 2011;9:12. Baranoff J, Hanrahan SJ, Kapur D, Connor JP. Acceptance as a process variable in relation to catastrophizing in multidisciplinary pain treatment. Eur J Pain 2013;17:101-10. Morone NE, Lynch CS, Greco CM, Tindle HA, Weiner DK. "I felt like a new person." the effects of mindfulness meditation on older adults with chronic pain: Qualitative narrative analysis of diary entries. J Pain 2008;9:841-8. Kabat-Zinn J, Lipworth L, Burney R. The clinical use of mindfulness meditation for the self-regulation of chronic pain. J Behav Med 1985;8:163-90. Plews-Ogan M, Owens JE, Goodman M, Wolfe P, Schorling J. A pilot study evaluating mindfulness-based stress reduction and massage for the management of chronic pain. J Gen Intern Med 2005;20:1136-8. Grossman P, Niemann L, Schmidt S, Walach H. Mindfulness-based stress reduction and health benefits. A meta-analysis. J Psychosom Res 2004;57:35-43. Sephton SE, Salmon P, Weissbecker I, Ulmer C, Floyd A, Hoover K, et al. Mindfulness meditation alleviates depressive symptoms in women with fibromyalgia: Results of a randomized clinical trial. Arthritis Rheum 2007;57:77-85.